New book, 80 pages, SS25068. The first swept-wing carrier-based fighter aircraft built for the US Navy, the F9F Cougar marked a major leap forward in the area of naval aircraft design from its predecessor, the straight-wing Grumman F9F Panther. The prototype of the first version of the Cougar, the F9F-6, first took to the air in September of 1951, just six months after contract award. There were several different models of the Cougar, reflecting its varied uses as well as the general development of the aircraft. The F9F-6 was followed by the F9F-7 and F9F-8. In addition there were also two reconnaissance models - the F9F-6P and the F9F-8P - as well as a two-seater trainer version, the F9F-8T. The contemporary photographs in this volume illustrate in detail the differences between the various Cougar models, making use of over a dozen display aircraft located in museums across the United States as well as one Cougar on display in Argentina. 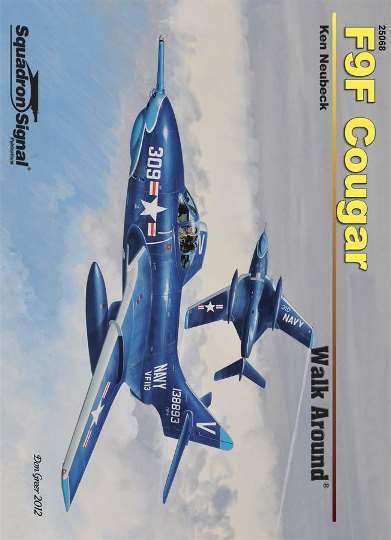 Grounded in solid historical research, the book also features historical images from the photo archives of both the U.S. Navy and Grumman, and also includes rare photos of F9F Cougar in its final days, serving as a target drone for later generations of fighters. Illustrated with over 230 photographs.